A few weeks ago we visited one of our favorite restaurants, Russo’s, located in Marble Falls, Texas. They have wonderful food and so many tasty options that it’s really hard to decide what to order. I wanted a little bit of everything, and luckily my mom was willing to share the zucchini spaghetti that she’d ordered. And by sharing, I mean one bite. With that one bite, I’d decided that I’d found a new favorite. 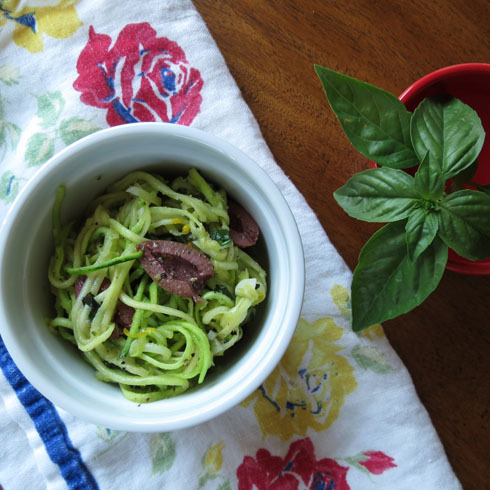 Offered on Russo’s menu as an alternative to regular pasta, zucchini spaghetti provides the sauce delivery system that I love, while leaving behind the heaviness and unwanted calories of traditional pasta. Bonus that it is nutritionally superior. The trick to making it at home is having the right tool. I love you, Lemon Zester. Unless you have kickin’ knife skills, you’re going to need a tool to create all of the thin, even zucchini strips. Unfortunately, I do not. Pair that with my HUGE fear of using a mandoline (which seems like it might be a good tool for the job as well), I knew I needed another option. I dug around in my utensil drawer and came up with the lemon zester. Turns out, it was AWESOME for creating these strips. Originally purchased for zest, I found that when I needed a dash of citrusy goodness, I preferred the microplane zester. But, not wanting to discard the first one, I just kept it around. And now I know why: zucchini spaghetti. With the right tool in hand, prepping the zucchini spaghetti is easy. Remove both ends of the zucchini and peel it, leaving behind some thin strips of the dark green peel if you’d like. 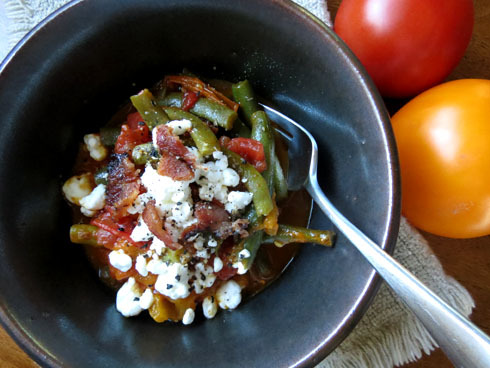 It does nothing for flavor, but does add a little bit of color contrast to the finished dish. 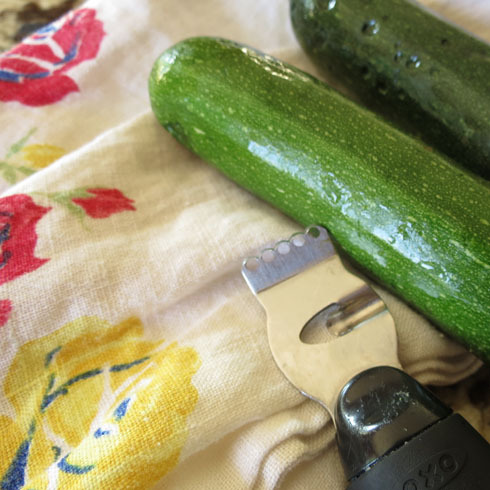 Holding the zucchini squash in one hand, scrape down one side with the multi-holed end of the zester to create long, thin strips. Roll the zucchini in your hand, continuing around the zucchini until you eventually reach the seed center. Discard the seed center, or save for another use. Prepping the zucchini takes just a few minutes, and should be done right before cooking. Heat olive oil in a pan over medium-high heat. When it’s hot, add the zucchini spaghetti and cook for two minutes. 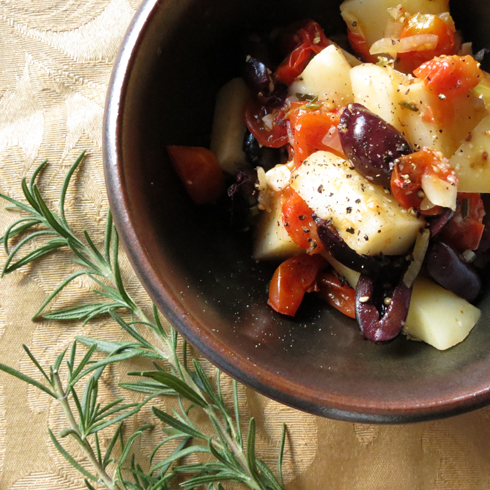 When considering the sauce for this recipe, I decided to take an idea from the dinner salad at Russo’s and combined Kalamata olives and orange zest. It is a refreshing and tasty combination, and works really well with the zucchini spaghetti and some fresh basil. I really loved this dish, and will definitely make it again as a side or a light lunch. Serving size: About 2/3 c.
Mix together kalamata olives and orange zest, set aside. Using a lemon zester or mandoline, cut zucchini into thin, long spaghetti-like strips. Turn zucchini and continue to create strips until you reach the seed center. Reserve the seed centers for another use. In a skillet, heat olive oil over medium-high heat. When hot, add garlic and cook 1 minute. Add zucchini and cook for 1 minute. Add wine and basil, cook for 1 minute. Remove from heat, stir in olive mixture, season with salt and pepper. Divide between plates, and drizzle with any remaining sauce. The best thing about watching the kids play baseball four nights a week is that we’re outside watching baseball. The worst thing is that we have a very small window to get home, ready for baseball, and eat dinner. The eating dinner part of this is particularly tricky because it needs to be ready, quick to eat, and something everyone will eat because there’s no time for dilly-dallying at the dinner table while we have an EAT YOUR DINNER SHOWDOWN. Last night I made a cold salad that I considered to be the ultimate meal – a base that everyone would enjoy, hidden protein, and lots of extra toppings to meet the needs of the picky palates at my table. 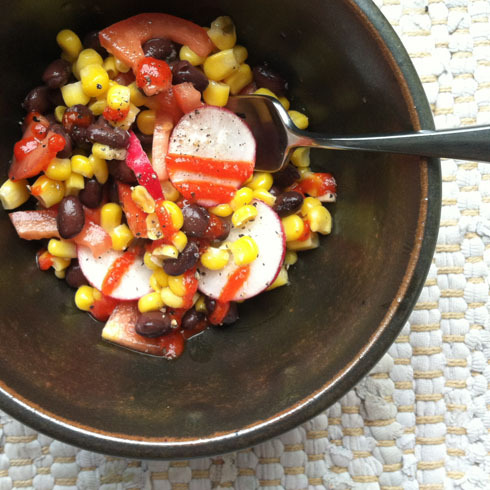 A cold salad featuring corn (everybody’s favorite), black beans, and tomatoes topped with a light honey-lime dressing. The dressing is really nice, a little sweet and kind of tangy; it has the kid friendliness of French dressing with the added benefit of not being French dressing. As I pulled out the bowls and encouraged everyone to DISH UP and ENJOY, I started to hear the words I dreaded most. Are the tomatoes already mixed in? Why isn’t this a pot pie? Using the words that I knew their baseball coaches would later in the night, I told them to HUSTLE and GET GOING and NOT EVERYTHING IS A POT PIE (okay, no baseball coach is likely to say this, but they could because it is totally true). I loved the dish, adding radishes and Sriracha to mine. Martin said that it was edible, and liked the dressing even though the tomatoes contaminated the rest of his food. And Sophie begged me to never to make it again. In a large bowl, mix together black beans through salt and pepper. Stir well to combine. For best flavor, refrigerate for an hour before serving. As is, this makes a nice side dish. Add avocado, cilantro, radishes, green onions, or jalapenos if desired. If serving as a main dish, serve in a bowl, over lettuce, in tortillas, or with corn chips. Top with salsa or sriracha for extra kick. Most of the time I plan when I plan meals, I get as far as choosing the main course and I lose interest. 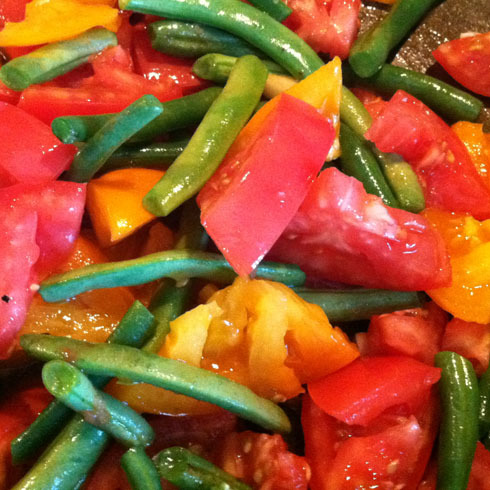 Sides usually consist of whatever vegetable I have on hand served steamed, cooked, or raw. Mostly I just want to make sure that we’re getting some vegetables in our diet with little added fat or calories. While this is very functional, I’ve noticed that I’m the only one who seems to enjoy this utilitarian approach. In the interest of mixing it up a bit, I decided to try some rice WITH vegetables. 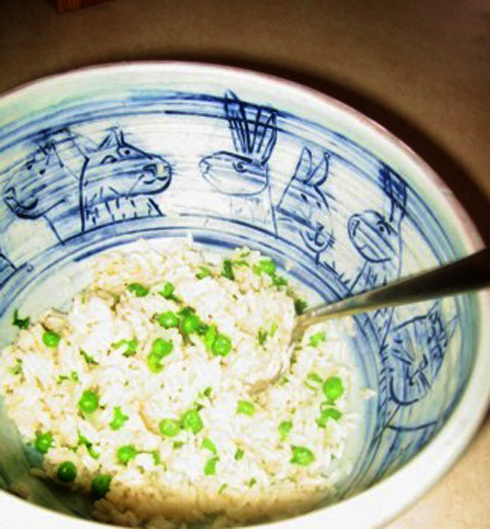 The kids always love fried rice, but it is pretty heavy in calories. Using less fat, this recipe tastes lighter and comes in at about 1/3 of the calories of fried rice. In a single serving, there isn’t a ton of vegetables, consider this more like baby steps to consuming GREEN. And by that, I mean the vegetable color, not a focused strategy for environmentally friendly side dishes. Melt the butter in a medium saucepan over medium‐high heat. Add the onions and cook, stirring, for 3 minutes. Add the garlic and cook, stirring, for 30 seconds. Add the rice, salt, and pepper, and cook, stirring, until the rice is glassy, about 2 minutes. Add the stock and bring to a boil. Reduce the heat to low, cover, and cook until almost all the liquid is absorbed, about 7 minutes. Add the peas and stir. Cover and continue to cook until the liquid is absorbed, about 3 minutes. Remove from the heat, stir, and let sit covered for 5 minutes. Fluff with a fork, add parsley and stir to combine. Adjust seasoning to taste and serve. – Any long grain rice can be substituted for the Jasmati. Right now my favorite rice is Texmati. Clearly I favor the MATI family. – This is also pretty good reheated, but you may want to add a bit of chicken stock or water when reheating. – Isn’t this bowl pretty? It was made by Minneapolis artist Mike Norman. It is one of my favorites. 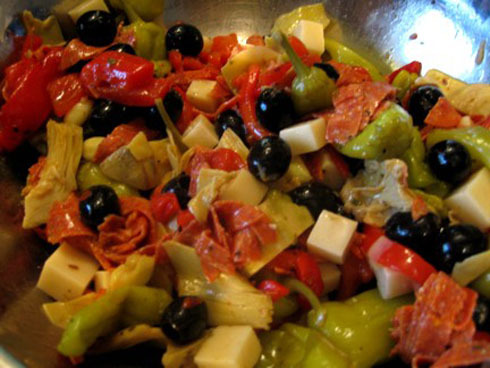 This Antipasto Salad recipe fits the bill and more. It is tasty, flavorful, feeds a large crowd, holds up for more than one day. Making it is as easy as opening up a few jars, doing some chopping, and mixing together. Combine all ingredients in a large bowl until everything is well mixed and coated in dressing. Place in refrigerator for at least 30 minutes and up to two days before serving. You can substitute dairy cheese for the non-dairy kind used in this recipe. When using non-dairy cheese, make it a day ahead so that the cheese has time to take on some of the other flavors. Trust me, it is better that way. Be careful when buying pepperoncini – there are both mild and spicy varieties. If you find that you’re serving up a larger than expected crowd, add chopped romaine right before serving to increase the yield.